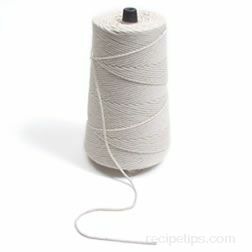 A thick string used for tying and trussing meat. It is also used to tie other foods. It is used on roasts, medallions, and tenderloins to help hold their shape and provide for more even cooking. Chicken is sometimes trussed with kitchen twine to help hold the wings and legs in place as the chicken is cooked. When barding, the twine is used to tie bacon or fat around the cut of meat. Kitchen twine works well for tying a bouquet garni to use in stews and sauces.